We have the luck of having a pool in our backyard since a few years. My little girl adores water and this was the perfect gift for her, but with time she realised it wasn't that fun to play at the pool all by herself... until she got a brother! Last summer my baby boy was almost two years old, so he finally was able to spend pool time with here sister, and they really enjoyed it! 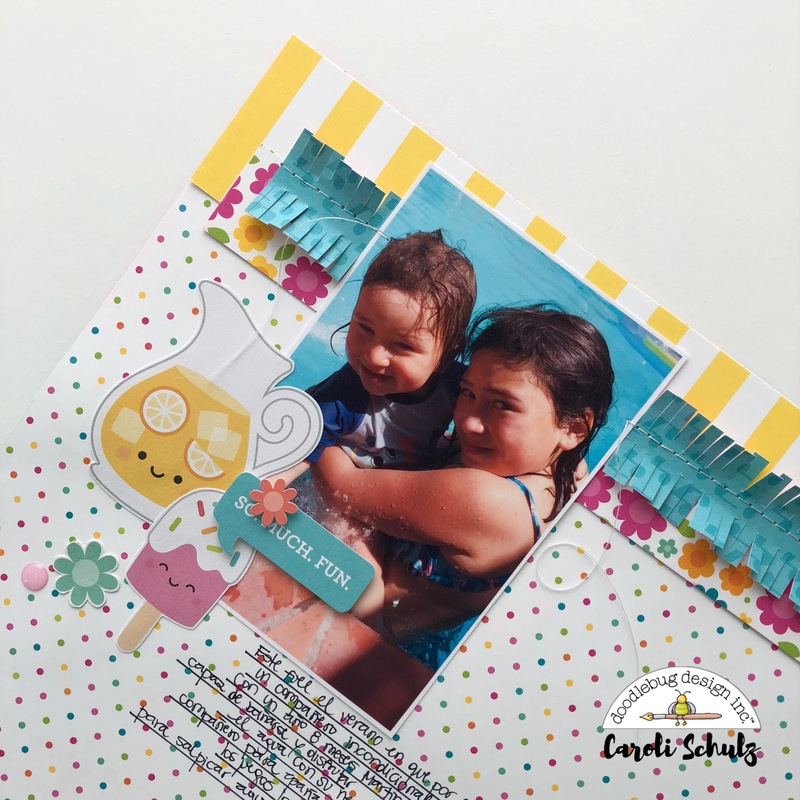 This is the happy memory I wanted to document in this fun and summery layout, using Sweet Summer collection. My idea is to have some kind if diagonal design in the page, so I placed the main photo on the top left and then created a little embellishment cluster around it. 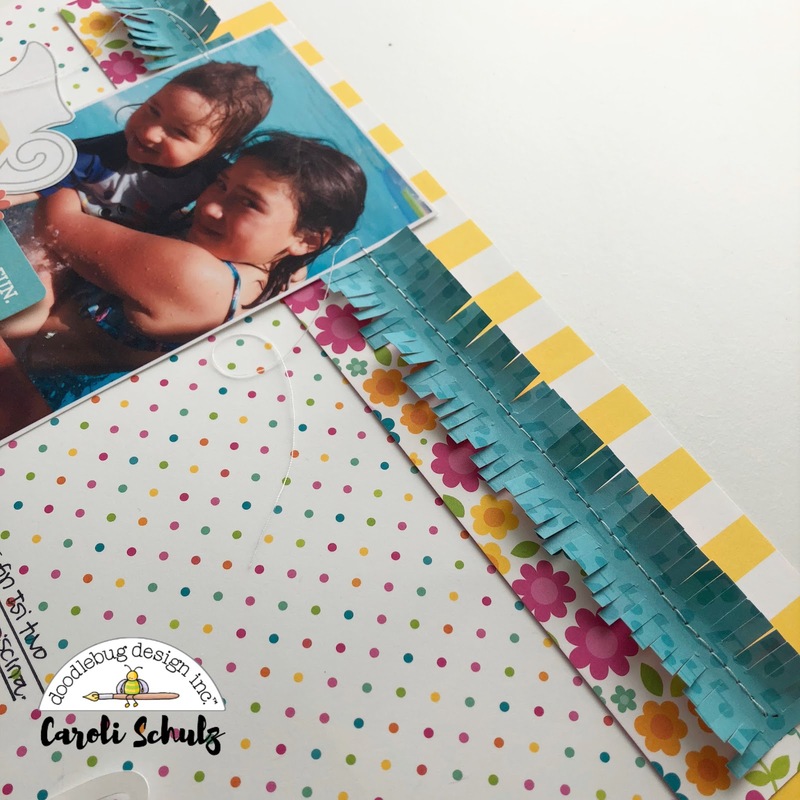 I used my fringe scissors to create a fringe strip on the top to add some volume to the page. Some sewing machine stitching completes the concept, and of course I left some loose thread here and there, I love this effect. I created a cluster of embellishments with different levels on the bottom right using some Odds&Ends and Chit Chat diecuts, this way the page looks balanced. For my title I cut the word "pool" using free font Sacramento in white cardstock; when the patterns are too busy or colorful I prefer to use white tittles to make them stand out. I completed my tittle using Abigail alpha in yellow color. I love how fresh and happy this layout came out, and most importantly, I love it documents some of the pool shenanigans of my little ones, the first summer they got to enjoy pool time together. This is what my journaling is all about here. I hope you liked this idea and now are inspired to start creating with Sweet Summer collection. Thank you for stopping by and have a lovely day! I love the fringe!! Gorgeous layout!